CrunchGear had mentioned about the new tool Yellowsn0w which helps in unlocking an iPhone 3G for any network all across the globe. This tool was developed by the iPhone Dev Team and seemed to work fine for some people and many had complains about it, from a small error to some permanent unlock disabilities. I still got an experimental iPhone(was a real phone but was a good experiment for me ;)) which belonged to my friend, and he wanted to get it unlocked. I assured him that i would do it, as i wanted to test this tool, and the dev team game me more confidence by telling that if the unlock isn’t successful, it won’t affect your iPhone. The phone would be as it was before. Then i started the unlocking with QuickPWN iPhone 2.2 jailbreak. 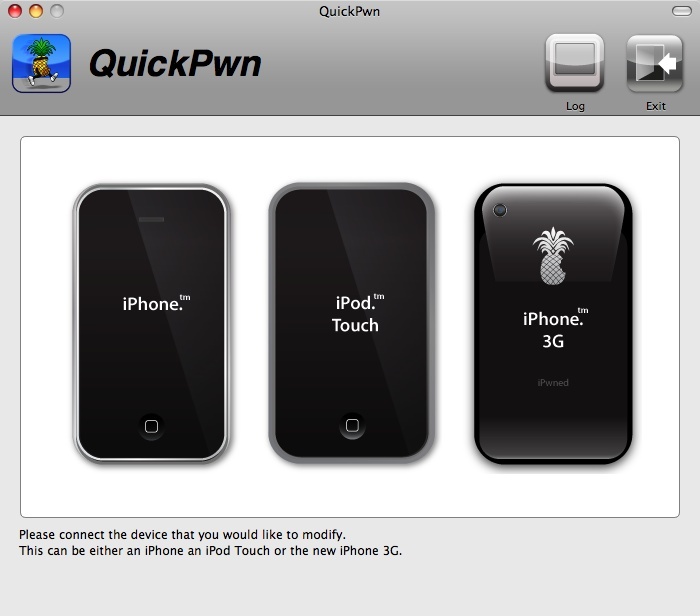 QuickPWN is the tool that Jailbreaks your iPhone. You can download the QuickPWN for Windows from here or QuickPWN for mac from here. A small note: Doing the entire process on mac is a better option, as Apple always easily works with some apple tool or product. Once you connect your device, the tool will automatically recognize it or else you do it manually. This tutorial is for iPhone 3G, so stick to it. You need to use the latest 2.2 version firmware to pwn your iPhone. Download that firmware from here. This update can allow you to install the Cydia which helps to run Yellowsn0w after the Jailbreaking is done. If you had already upgraded your phone very recently, to the 2.2 version, then there is no need for an update. Still, if you wish, the QuickPWN tool can download and install the firmware from its interface itself. The IPSW is built, and then the rebuilding with sending of data from your computer is done. The firmware sending is finished, and you get this confirmation. The QuickPWN tool will need you to follow a few steps that it explains. And everything goes fine if you do it correctly. This ends Jailbreaking of your mobile phone. After this, you need to install Cydia through the installer, and Cydia would then appear in the list of apps in the iPhone. In Cydia, you need to add the source for yellowsn0w, to download the latest version of the tool. On the home screen of Cydia, go to “Manage” in the bottom bar, and go the “Sources” section. Click on Add in the top left corner. Then click on the added URL and you would be taken to the download page of Yellowsn0w. These couple images would help you understand the pages. Now once you have installed yellowsn0w, you will be asked to restart Cydia, and that’s the green signal for successful installation of yellowsn0w to your iPhone. This will clear everything related to your present network. Now, switch off the phone, and insert the SIM of network you want and switch on the phone. Wait for a couple of minutes, and then remove the SIM, insert it back. I got a message “SIM INVALID” but still waited for a couple of minutes and turned the Airplane Mode in settings On and Off. Then wait for a minute. You would see the network automatically getting detected and signals being received. I tried doing this with Airtel in India and could make calls the next moment i saw the name in the top left of the phone. * If you are in U.S., switch off your 3G settings and then do the SIM registration process. Thanks to QuickPWN, Apple Dev guys for yellowsn0w which helped in unlocking the iPhone 3G pretty easily which i thought was impossible for me before i started it. I can assist you if you are in the same process, just follow me @ twitter – sizzler_chetan or contact me! Subscribe to get more tips. For everyone who are not able to do it, here is an advice. Better upgrade your firmware to 3.0 version which the latest one released by Apple and then you will have an option to unlock the phone using ultrasn0w. If you are not sure how to do that, here is how to upgrade to 3.0 firmware of Apple. Also if you are using a 2G phone, here is how to unlock iPhone 2G. Brilliant post Chetan, It’s time now for me to get an Iphone and give it to you for the unlock. it was my phone which we unlocked it seemed difficult and fun as the procedure is easy and not at all harmful to your phone in the long go. .
Thats a nice detailed guide. Hey dude, you really got it going good. I got my phone unlocked perfectly following the steps for T-Mo here in US. I have been unlocking iPhones a long time. However I would like you to add another note: If you got password enabled for whatever reason including Exchange Mail then disable the password and then the sim is recognized in a go. Since iphone is 200$ in US, is it legal to buy an iphone in US, then break the service contract, unlock it and use it in India ? I heard that they track such unlocked phones and fine u ? @I could unlock iPhone 3G with yellowsn0w tool | Chetan Bhawani: Hello Chetan, I have a question, has the 3g to be switched off during the process, and, do I need to have access to wifi during the unlock process? Thanks.. David. There seem to be so many tricks to “hacking” or messing around with your iPhone.. When you are in the U.S., you need to have 3G switched off to unlock the phone, but access to Wi-Fi is needed for the Cydia app to download the yellowsn0w tool into phone. @amrish: You might have heard it right, but actually a couple of my friends are using the U.S. devices, but never got tracked or warned after they unlocked and used the iPhone for months. Thank you for all the info, it all worked, but no signal for simcard, what should I do? i have restarted couple of times with and without simcard, then insert it, but still no signal? @iphonefanza: You should follow it correctly. Reset network settings and switch off the iPhone. Then insert the SIM and switch on the phone, wait for a couple of minutes after the phone starts. Then turn on the airplane mode for a few seconds and turn off the airplane mode. Remove the SIM with the iPhone On, and re-insert it and wait for a minute. This is how it worked out for me. THANK You, I got it working! Now I need to figure out how to get photos & contacts back from before the 2.2 version, any suggestions? @iphonefanza: Did you have things in the iPhone before you unlocked it? If it was, then I think they are lost already when you jailbroke the phone with QuickPWN tool as the firmware upgrade deletes all the data and makes the phone completely new and nothing is left in it. The same happened to me, losing all the 70 favorite applications I had, unknowing that they would go with the Jailbreak and unlocking process. it had more that a thousand photos on, which were not backed up to computer. I dont know iphone very well yet, and when i plugged it into the computer for the first time, i had to upgrade itunes, then the iphone said there is upgrade and i just said yes, without thinking/knowing that i had to backup the data. thats when it simlocked, and i could not get into the phone at all. now i can, but have no data. @iphonefanza: That’s sad, and i tried to find out things in my friend’s iPhone and it shows no data. And i find no relevant information on the web about it. So assume the data toe be lost totally. Thank you Chetan, I will also go in further search, will let you know if i find something. GREAT WORK! im using My 3G for T-Mobile US and this worked excellent no problems! Nice to c the phone back in use..
@Chetan – after jainbreaking and unlocking, cant we use the backup’s on iTunes to get all the data back? Thx. Thanks Chetan (and the phone dev team)! I’m on vodacom in South Africa (o2locked iphone) and that worked perfectly, first time. Brilliant! Is there anything I must NOT do now, to avoid problems??? Thank you so much for helping me, do I still have to keep the applications on the IPhone and anything that I shouldn’t do to avoid problems? @Bear: Great to know it worked. @Deep: If you have backup in iTunes, then you can surely get the data back. Many people fail to backup the data and so complain of losing everything. Its good if you have the backup, and so you can get it back into your iPhone. @Kattbatt: Good that it worked for you too. There is nothing else you need to do, just let me know anytime you see any problems. I might try to help you out. @Jimmy: Applications do not have any link with the unlocking. Still, the Installer and Cydia apps that you have used to unlock have to stay in the iPhone as of what i saw. After i deleted Cydia and restarted the phone, the network could not be recognized, so keeping them would be good. I know this is a little off-topic, but the Iphone 3G can only accept ring-tones up to 30 seconds? and do you know anything about custom SMS tones? Sorry I don’t mean to double-post, but is there a way to access the Internet without using Wi-Fi? I am with T-Mobile now and using the Sidekick LX with Internet package. @Jimmy: I’m not sure about the internet packages, as what i use is Wi-Fi to access the internet in the iPhone. And for the ringtones, the 30 second limit is right. I have never tried the custom SMS tones. after so long strugling with my 2.2 software locked. Anyone knows if after Unlocking, if I turn OFF the iphone will the Unlock become void? I just turned off my Iphone (which was unlocked) and when I turned it back on – I lost my Phone service totally. Has this anything to do with a Software Unlock issue. hello every1 now this procedure of iphone unlocking and jailbreaking looks promising..i want help..
i mean i am planning to get an iphone 3g from usa…i can get it but the problem is i am worried if it will not be unlocked…then it will be a total waste for me…so wat do u suggest should i go for 1 without worrying…and also i am scared that whether repeated attempts to unlock my phone may leave my phone permanently tampered and non functional…..wat should i do should i go for a new i phone 3g and then follow the steps u have shown…..or wait longer,….. Using a Telstra Service that requires me to enter a pin into unlock. Any further advise would be appreciated. Please note, this does not happen with a pre paid SIM, only a Telstra SIM account that requires a pin every time your phone it switched on. I’ve turned it off and reset it and I still retain the original unlock features, don’t know whats wrong but the best bet is to probably “restore” it from ITUNES and try it all over again. No harm if you do so. Thanks Jimmy for your feedback. I am new to this and am afraid to restore anything from Itunes since I read somewhere that it could lock your phones up. I hope to hear from feedback from others otherwise I may have to bring it back to Apple but I doubt they will help since the phone has been modified. Once again Jimmy, thanks for your help. Since I was also having problems with SIM eject. I just went into a local Apple store. The Genius discovered that the eject spring is faulty and offered to exchange another phone – so I got a new phone that is now locked to ATT so I guess I have a new problem and that is to unlock it. I will try following the instructions in here but being a newbie at this I am afraid I might screw up. Just take your time, I know I did. This was also my first time too. I just carefully followed the instructions. 2. Download QuickPwn, and its firmware on this web-site. 3. Extract QuickPwn and open it up; it will ask you to make sure Iphone is connected and then browse for the “firmware” that you downloaded off this web-page, not from Itunes. 4. Follow the instructions on “jailbreaking” your Iphone. 5. Open up Cydia, it should be installed when you jailbreak your phone. 9. Your all set, I might have missed something if I did, sorry. I am in US and using iphone3G with AT&T , can you please mail me the detail guide to unlock. it will be good for me. I have succeeded through patiently reading and following all yours and others’ advice. It now works marvelously with all the various SIMs I have. hey .. when i go to add the source it comes that it did not find repository.. what do i do ? Glad to be of assistance, we should all be thanking Chetan for his tremendous help though. He deserves all the credit. I will be returning back to india soon, so can you please mail me the guide or steps. @bala: Thanks for the appreciation and glad that it worked for you. @soundar: You can connect the iPhone to your computer and download Yellowsn0w in Cydia through iTunes connected phone. @Jimmy: Your procedure was exactly what i explained and still happy that you helped few others with it. Happy to see that unlocking tutorial coming into use for you too. @Sunil: I have nothing special than the step-by-step procedure as given in this post. You can read it and follow the instructions as given in the post to unlock your iPhone. Thanks for the kind reply, just one question , right now my firmware version is 2.1, so should i update to 2.2 using itunes and then follow the steps in post, is that right. just let me know. Can you please help Indians too Chetan. Could you be able to explain the steps involved in connecting the iPhone (3G) to a computer and in downloading Yellowsn0w in Cydia through iTunes connected iphone. Any luck with the problem I posted? If i unlock using your method I have to use a pre paid SIM card, then switch to our other SIM. If i power off and then back on, it does not work until i put in my pre paid sim card, then switch it over! Any ideas or comments would be helpful! @Sunil: There are not many fixes in the new update, so no need to experiment things and upgrade your firmware. @Maddy: I will soon let you guys know by posting it here. @Joe: You earlier said that you did it using Telstra network. Did you do the same with any other prepaid service? As i am not sure because i never have worked on any other international networks except the Indian ones. when i tried installing this it keeps asking me to find the version of firmware i have on the iphone…i dont have any firmware installed on my pc, does anyone know what this is about? I jailbroke my iPhone a few monhs back. Now I tried to install the unlocking source and everytime I install the source my phone crashes and the source is not installed. @Shivam: What firmware version you are using? It should be the 2.2 version and not the older one. so my phone is locked again now, what i wanted to do is i wanna unlock myself, just in case i need to do it in the future, so i restore back to default setting, and just follow what have u taught here, anything else i have to do? upgrade to firmware 2.2 first? may i kow what is the original firmware of iphone 3g? oh yeah, mine is US set, also, if i have to upgrade first, can i download from here? i thought i restore back to factory? i restored and try to run quickpwn, it said my device firmware is that new one, y it doesnt back to factory version? I tried adding (1) song onto my Iphone and unplugged it from the labtop and all my songs deleted. Is there any way to restore it to previous setting because it said backing up Iphone when I synced it. i got the iphone 3g and used quickpwn to unlock it and it worked fine, just would not connect the the tmobile network with my sim card in it. After that i tried plugging it into itunes to put music on it and accidentally restored the factory settings so now the firware is completely changing and i cannot unlock it again, for some reason quickpwn only works with sertain firmware….PLEASE HELP!! i spent 600 dollars on this phone and have had it for 3 weeks now but can never seem to get it to work! everytime i run quickpwn it says to select the current firmware you are using on the iphone and i dont have that on my pc…it was automatically updated with itunes how do i get that??? I have a 3G iPhone 16Gb which was purchased from Airtel and given to me. I already have a Vodafone and Idea Connection.Chetan can u help me to unlock the phone for helping me to use on either Vodafone or Idea SIM. Can u guide me which sim will suit better for iPhone between Vodafone and Idea. Chetan, very good post. You have sent detailed screenshots and it worked perfectly fine for me, I had a Vodafone sim and it came up immediately. Didnt have to restart, airplane mode … nothing just followed your instructions and the unlock was smooth. hey, um i dont get the sim message how come? i am at iphone3g user with att and i am flying back to india on 26th feb , just wanted to know if i came back there will be no service for att. so can i unlock the iphone in india with u r tutorial. It worked first time for me i’m over the moon, btw carrier is orange UK!! thanks for the brill guide!!! Hey, I’ve had my iphone 3g (version 2.2, firmware 02.28.00) since christmas and still haven’t got it unlocked…so annoying! i jailbroke my phone using quickpwn and installed yellowsn0w 0.9.6 through cydia but unfortunately this did not unlock my phone for some reason (even after trying to reboot, toogleairplane mode on and off etc)…so i then i decided to maybe re-install yellowsn0w and try again. ive now installed yellowsn0w 0.9.8 but iphone is still not picking up coverage (still displaying no service!) this is annoying me so much and i really want to get my iphone up and running…any ideas of what i could do to fix this? any help would be greatful. 1 am about to buy iphone 3g in us….contracted with at&t. please….will i be able to unlock it by above steps??? This tutorial works!!! I just unlocked my iphone. However, DO NOT USE THE LATEST FIRMWARE FROM ITUNES since it has a different base point even though it is still 2.2.1 and will give you FIRMWARE STRING ERROR. I had two iphones and made the mistake of upgrading to the latest firmware from itunes and got the error. When unlocking,do I leave a sim card in iphone or not ? The current sim card it isn’t activated now. I bought a iphone from ebay and is unlocked and my carrier is t-mobile,could u help me to use my iphone.it shows only emergency call. Tried but could not get the O2 sim recognised by the phone, tried the airplane mode on and off but the search did not locate a network – please Help! i have wi fi and am not getting the phone to gonnect when i hit the Cydia button it says unable to load no internet connection. i put in the wi fi password and it shows the wi fi logo. it also asked me if i was the developer hacker or a third option i dont remember. any help you can provide me with will be appreciated. Im so close..
it all worked, but no signal for simcard. also i reset the newwork settings and swithed on/ off to airplane mode and followed complete sequence but it does not find signal. one thing i need to mention, when I reset network settings, it automatically restard iphone, then I swiched off the phone manaully. do i have to switch it off as soon as it tries to restart after resetting network? also the i got yellowsn0w ver. 9.8. may be this is causing any problem? please help as I am stuck here. Thanks for this detailed tutorial.My iphone was locked when i installed updates 2.2, and had already been jailbreak with quickpwn, i have been using it as ipod touch when i saw this tutorial. Followed all the steps,i installed yellowsn0w ver. 9.8.reset the network settings and switched on/ off to airplane mode and followed all instructns, but iphone is still not picking up coverage, still displays no service.What do i need to do again, need help urgently. I did this but then there is no iphone function. If I take out the sim card it says “no sim” but there is no phone network with card. Any ideas? I got my iphone jailbroken and unlocked with a turbo sim (but the person did not show me the proof of the same) in the US itself before coming to India for a vacation. But Im not able to get it working with airtel now.. I actually restarted my phone a lot of times… no use. hi i have a similar prob i unlocked my 3G phone and upgraded to 2.2 then i connected to i tunes>it asked me if i wanted to upgrade 2.2.1 i stupidly said yes!now its locked!!! !how did u get urs to work again?thanks for ur help im really upset! I did all the steps correctly, But when i put my sim card into the iphone it is not picking up the service any suggestions? 1- if the iphone shows only for emergency should i need to do something before all this? 2- should i have the original sim card on the phone on the process or no sim at all? hey… i’m having problem with my iphone 3g… i can’t seem to get a service.. it shows the carrier and the available networks.. but yet it says network lost and no service.. what should i do?? i’ve unlocked it already and everything.. it worked and all of a sudden it just started showing no service… i’m using a turbo sim because without it, it doesn’t even read the carrier… any help please..!?!? I have the latest iphone with newest software and boot loader. I’m being told there is currently no way to unlock this version yet. First, is this correct? If not, what else can I do because I tried your instructions and it still didn’t unlock it. Would really appreciate if Chetan or someone could guide me. I jailbroke my iphone using quickpwn, installed cydia and installer as instructed in chetan’s tutorial but am stuck at the step in which you are supposed to download yellowsnow through the phone. I got my iphone from US(ATnT) where i had a data plan but now i have no internet/wifi on my phone. Was wondering if ther is anyway i can download it through my PC ? Could you be able to explain the steps involved in connecting the iPhone (3G) to a computer and in downloading Yellowsn0w in Cydia through iTunes connected iphone ? Seearched for yellowsn0w on itunes but couldnt find it, also tried to use the link http://apt9.yellowsn0w.com , it just takes me to a blang page. Does anyone know a link to download yellowsnow ? wakar, it’s easy to solve your problem. just remove your sim card from your iphone. put the sim card in another phone and make a call. then remove the sim and put it back to your iphone. it’ll work. abby, what firmware do you have now? send me your e-mail i’ll forward you a step-by-step guide to get to yellowsn0w to unlock your phone. it’s pretty easy to do after you’ve jailbroken the phone. i finally summoned the courage to unlock by phone over the weekend and it works fine without a turbo sim and all the lost signals. @ ken koh – thanks! i finally installed the yellowsn0w on my phone and followed exactly the steps listed above after installing yellowsn0w but i still dont see any network after restarting with the 3rd party sim(vodafone in my case). Where do u think i might have possibly gone wrong ? The firmware that i am using is 2.2.1 (i have a 3g). abby, i’m beginning to think you’re in the same dilemma as those users with version 2.2.1 and baseband 02.30.03. until the dev team came up with a new version, current version of yellowsn0w can’t unlock your iphone. good luck. Chetan…you rock…managed to get my 3g working again…however..it doesnt pick up any wireless signal…im pretty scared cause many ppl seem to have the same problem and they seem to think its a hardware issue…and apple is def not going to replace an unlocked iphone..do you know anything about this? You can try unlocking it with 3.0 as I never tried doing it with BSNL SIM card, so not sure. Sorry! Btw be caureful with the firmware version. Don’t be in a hurry as the latest versions which are the improvements from 3.0 are actually built to permanently disable the unlock function. So don’t upgrade the phone to latest firmware. Let me know if anything works, as I didn’t encounter any problem in the past related to wireless network. Thanks Chetan, to jailbreak WiFi or EDGE is necessary I don’t have WiFi I don’t know about this is the EDGE & GPRS is the same. Thanks for the great article, I would like to know one thing i.e do you need ATT sim to unlock it. I’m planning to get iphone 3G the unlocked one but that may not have any ATT sim. Man can you do the same update on a 3GS ? My i phone 3G version 3.1.2 i am not able to use this software.. wat shud i do ? Jailbreak may not work some times it takes several attempt. if jailbreak didn’t work or something happens hold the power botton and home botton until it restarts. I have got apple iphone 3G from USA. It was jailbroken in USA and I used in with T mobile there alongiwith turbo SIM. I got it to India and it was working fine with idea SIM card(with turbo SIM) and when I insered vodaphone card with turbo SIM it got locked. It says ‘No SIM card Installed’. Please could you help me unlock it. In it’s about version is 2.2.1(5H11). I could connect to my wi-fi network though. 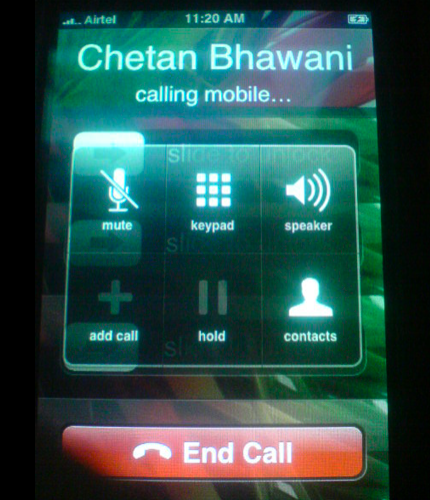 Chetan, can this be used to unlock the iphone 3G to use it with a tmobile sim? A friend of mine recommended to reset networks and after I did that, I lost my data service. I read the posts above and pulled to sim card out and used it on other phone and placed it back to my iPhone but still no service… What should I do? Thanks in advance. i’m from turkey. you can use 4G to this year. but 3g is yet comed here. best regards..
Hi, I got my iPhone unlocked OFFICIALLY, which I had got from Airtel 13 months ago. It was painful though. For 1 week, I wrote mails to NodalOfficer.KK@airtel.in & 121@airtelindia.com, but it did not help. Then my friend visited the Airtel Showroom where I had bought the iPhone. And those guys finally got it unlocked. I had send them email at kk.brandshop1@airtel.in. The Airtel interface that worked: Airtel showroom where I had bought the iPhone. Earlier, on request, Airtel unlocked iPhone after 12 months. Though currently it seems that Airtel no longer officially unlocks it http://support.apple.com/kb/HT1937. Now I am successfully using my iPhone in Finalnd with a local operator. I am from Australia. I have this new Iphone 3g (8GB)got from Optus service provider as a replacement to old damaged phone. But I have already lost he sim and have my contract cancelled. That means I have phone brand new but unlocked. How do I register this phone with a prepaid sim & same time unlock it to work. O dont even know how to load Itunes in it. Please help me? You first need to know what iTunes software is. It should be there in you computer. Do you use Windows or Mac OS? Also, you can place another SIM and follow the above procedure after you check about iTunes and start using it. Iam planning to buy the latest Apple Iphone 3GS from the US,have heard so much about your expertise in unlocking the phones, would truely appreciate a step by step process to unlock the phone as i have been trying to get one from US since a year as in India can’t really afford to pay so much, so finally iam getting it and your help in unlocking the same will really help. Hey, i am trying to unlock my iphone because i refuse to pay $150 for telstra to unlock it and i found this website and im not sure if this is a spam or will it damage my iphone in any way if it doesnt work? I buy the latest Apple Iphone 3GS from the US,I unlocked it by a dealer….he uses the same cydia ..(by a Icon in my menu)…but he said that If u switch of ur phone then it cant work for ur sim….& it may not work for further…..
Hi I am currently trying to jailbreak my iphone but having no luck i tried the first method but the quickpwn software dont load then I noticed a comment by ritchie with the blackrain software that also didnt work starts up has one error message and stop once i click on let it rain. I have 3.1.3 on my iphone 16gb can someone help a guy a out I really would like to use this on another network if possible. hey dude i bought an apple 3gs 16gb iphone frm us……. can i unlock that phone here in india…..
if yes plz tell me how can i…? My mobile was unlocked and I was using it well. Unknowingly I upgraded some mobile software and since then I get invalid SIM message. Can you help me what I need to do. I am from Turkey. I have this new Iphone 3g (8GB)got from Optus service provider as a replacement to old damaged phone. But I have already lost he sim and have my contract cancelled. That means I have phone brand new but unlocked. How do I register this phone with a prepaid sim & same time unlock it to work. O dont even know how to load Itunes in it. Please help me? I’m from Sri Lanka, have an iphone 3gs. When I switch it on it says to connect to itunes then to restore. But it’s giving an error msg after trying to restore. Pls help me how can I get ready to use this phone. My email address is al-gates@hotmail.com. What if your network like mine “sprint” doesn’t have a simcard system like others? I have iphone 3G, bought ir in Egypt, moved to South Africa, will it open the network for me?? hey….does it only work for indian mobile network or it works for any mobile network in the world….??? heyyy i hv apple 3g and there is network problem after unloking phone so wt to do ???? so plz replay me as soon as possible …..it’s urgent dear …………. will it work for iphone 3gs or its only for iphone 3g?? How can i use my iphone 3GS from Airtel to IDEA? i have upgraded the firmware to 4.0 in iphone. I want to use vodacom,so when i enter the sim card it say sim card registration failed.plz need a help.my serial no: 351987048636149 and phone model nokia xpressmusic. I have jailbroken and unlocked my Iphone 3GS. It is all working perfectly (touch wood). After my first attempt to unlock (with redsnow) my phone (which worked) I switched it off and when I was trying to turn it back on it reset to its original setting and had to unlock it again. Can anyone enlighten me whether I am able to turn the phone off at all after unlocking it and jailbroke it or turning off is not possible any more. I am thinking of going on a long haul flight where I might want to turn it off to save battery rather than putting it into flight mode. If i unlock my iPhone 3Gs, can i still install applications without anything resetting?? by mistake i did factory reset on a jail broken phone and now its froozen. it was not my phone . do u think we need to jail break it again and how. successful unlock of iPhone 4g. Dude I need to unlock my I phone 4! If u are local emailme at frndlyaquarius@gmail.com I would rather pay u and get it done and over with than go crazy on my own! Hi I have both 3g and 4g iphone both at blocked on 02 is there anyway i can use this on other networks?? Pls help. Please give me the appropriate solution, how can I unlock network in my iPhone? Its urgent….